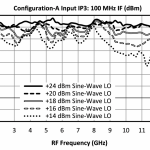 Mixer linearity is continuously and permanently a critical problem faced in RF system design. The nonlinear action of all physically realizable RF mixers propagates throughout signal chains generating undesired, unfilterable output harmonics, multitone intermodulation, and nonrecoverable nonlinear signal distortion. For example, nonlinear mixing action can cause undesired output harmonics (i.e., spurs) such as the or the spur instead of the desired converted signal. In multitone applications, such as data transmission and radar tracking, mixing heavily exacerbates the problem of spectral purity by not only introducing a second set of unwanted, unfilterable output harmonics but by also introducing multitone intermodulation distortion (IMD). IP3, or the 3rd order intercept point (TOI), is the figure of merit by which industry judges the linearity of all active, power-consuming RF components and their ability to maintain core linear assumptions about circuits. The mixer is no exception. A power calibrated vector network analyzer and an external driving synthesizer is the standard tool to do IP3 measurements. While VNAs have their own errors, such as limited RF input power and poor 2nd input harmonic suppressions, it is the most convenient and time efficient way to measure IP3 over broadband frequency sweeps. Spectrum analyzers, although highly susceptible to user error, provide a secondary way of doing comparable IP3 measurements. Both measurement on a spectrum analyzer and a VNA should agree. This document serves as a tool for debugging, developing, and utilizing the spectrum analyzer, it’s supporting synthesizers, and other RF paraphernalia for mixer IP3 measurements. The most important thing to understand about the IP3 specification is that, like a mixer’s spurious suppression, it is a measure of your in-band spur-free dynamic range, and how linear your output signal is. IP3 is not a directly measured mixer parameter like conversion loss, return loss, or isolation. IP3 is a figure of merit of device linearity based on the relationship between a 2-tone analytic signal and its resulting self-intermodulation terms. For the case where a mixer is used as a downconverter with a low side LO, is the average power of the analytic 2-tone RF input signal. is the average power of the down converted 2-tone RF input to the frequencies and . is the average power of the spurious output that appears at and . is a mixing product of the 2-tone RF input and mixer generated second order intermodulation products to the and frequencies. For an upconverter, the principal is the same. 1. Depiction of where the 2nd and 3rd order IMD products fall in a mixer output spectrum based on a 2-tone RF input signal. Frequency plan based on a mixer used in a down conversion of and using a highside LO. IIP3 is input referred IP3 and OIP3 is output referred. This can be measured in either an up-conversion or down-conversion and the result of which should be roughly equivalent for the same or similar frequency plan (RF, LO, and IF frequency bands and power levels). To visualize what OIP3 means, see figure 2 for what could typically be seen on a spectrum analyzer for a downconverted 2-tone signal. 2. Example output spectrum of an IP3 measurement. Output will include unwanted harmonics such as those close to the carrier. First, there is the need to clarify the difference between IMD products and spurious products of a mixer. IMD tones are generated from multiple, close input fundamental frequencies, or and or . They are not generated from harmonic mixing of the RF/IF signal and the LO signal. An example IMD product is the harmonic. Spurious products, such as the spur, are the result of the unwanted harmonic mixing of the RF/IF signal and the LO signal. Similarly, for a mixer’s IP2, you’re not interested in measuring the power of the spur, you’re interested in the or spur. 3. DUT test frequency plan for a 2-tone RF input. Mixer tested as a down converter from 6GHz RF to 300MHz IF. The frequency plan above is the frequency plan of the running example of this document. The example measurement in this document will be done as a down conversion with the MM1-0312HS (unless otherwise specified) from 6GHz +/- 0.5MHz RF to 299MHz +/-0.5MHz IF with a low side fixed 5.701GHz LO. For convention, RF refers to the high frequency small signal input that will be mixed down to the low frequency IF output. The RF signal is input into port 1, LO into port 3, and IF is output from port 2 (configuration B). 4. Mixer input/output signal configuration. RF signal is input into port 1, LO signal into port 3, and the IF signal is pulled from port 2. First, we generate a combined 2-tone input signal with 2 synthesizers and any power divider (i.e., power combiner); for instance, the PD-0010 resistive power divider. is the 6.0005GHz tone and is the 5.9995GHz tone. Both tones have +0dBm power, verified on both a filtered power meter and our Rohde and Schwarz FSW85 spectrum analyzer. It’s important to understand we’re trying to only test our mixer so we must always power calibrate to the plane of the mixer’s RF port. To avoid measurement error, we must calibrate to only the fundamental tone. Using an unfiltered power meter to do this measurement is slightly erroneous because power meters measure the total output power of a signal. This includes all harmonics in addition to the fundamental tone power. 5. Quick and dirty mixer IP3 measurement. Measurement may or may not be accurate with this setup. We repeat the power calibration step for the LO source set at 5.701GHz, +15dBm. It is extremely important that sufficient LO power is used to fully turn on a mixer or else risk unpredictable results. Mixers are heavily LO power dependent, if LO power is varied, the IP3 measurement result can and will vary widely. If insufficient LO power is delivered, the conversion loss suffers heavily and will provide erroneous IP3 results. 6. IF output spectrum of the MM1-0312HS with the block diagram setup from figure 5. After calibrating, the mixer is connected as shown in figure 6. When we calculate the IP3 value, we typically average both down converted tones and both IMD spurs. So, remembering that the data displayed on the screen of the spectrum analyzer is the mixer’s output, we can first calculate the mixer’s OIP3 and then back calculate the mixer’s IIP3 because we know the RF input power. For a “quick and dirty” measurement the result is not bad. It relatively matches the value displayed on the datasheet. This was a straight forward measurement where we did not consider non-idealities in the measurement, and implicitly trusted our test equipment to report the actual IP3 value. As a rule of thumb, if the mixer’s IP3 is below +25dBm, this is a sufficient setup with modern test equipment. To provide more accurate data however, we must account for the non-idealities. To account for all of the non-idealities in the measure we look mainly at the small signal RF input for the down conversion measurement. In figure 8, we see that the “quick and dirty” measurement’s spectrum is fairly clean by casual standards; the IMD3 spurs are not stronger than -80dBm. This establishes part of the IP3 measurement floor. This floor isn’t good enough for the most accurate mixer IP3 results. To get the best results, we need to decrease the IMD3 tone power of the input. Getting an ideal result of no input intermodulation products is not possible, although they can be greatly suppressed. 7. Spectrum of the 2-tone RF input into the MM1-0312HS with the block diagram from figure 5. The 2nd harmonic inputs at and are very low power (or should be). The and will mix down to and and should be accounted for; a passive diode mixer will respond to any signal of any power. If an RF amplifier is used, the 2nd harmonic should be filtered off. 8. Diplexers added after the signal sources from figure 4. Lowpass port of the diplexer passes the signal. Input and terms terminated in highpass port with a 50Ω termination. Lowpass filter the 2nd harmonic of and to eliminate a low power source of intermodulation within the mixer. This is done with the lowpass port of an applicable diplexer. Unwanted high frequency signals will not be reflected but instead be sunk into the highpass port and its 50Ω termination. 9. Spectrum of the 2-tone RF input into the MM1-0312HS with the block diagram from figure 8. There is a marginal gain in the 2-tone RF input IP3 as a result of the lowpass filters. Not surprisingly this results in no change in the mixer’s IP3 measurement. 10. IF output spectrum of the MM1-0312HS with the block diagram setup from figure 8. Another major, but less obvious, source of error is the cross talk between the two RF input synthesizers. All synthesizers have a phase locked loop (PLL) to lock the output frequency to an internal (or external) reference frequency. When a reverse signal is present, either from a mismatched load reflecting power back, or from cross-talk introduced from an external signal source, the phase detector in the PLL will respond. Even if an RF amplifier is at the output of the PLL the amplifier reverse isolation is finite and will leak power into the phase detector. 11. 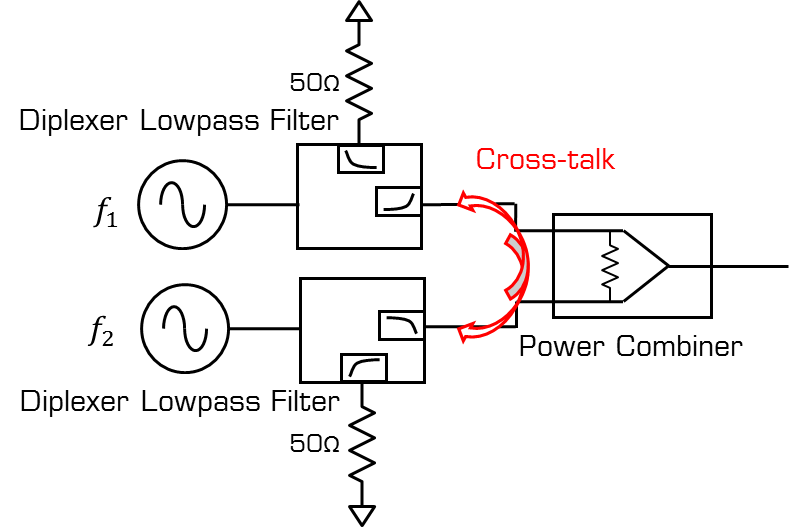 Example phased locked loop showing a possible reverse signal path. The feedback path of the PLL will account for anymismatched reflection. If instead, a 2nd RF input synthesizer were to be the reverse signal, then the phase detector block of the PLL will produce its own harmonics from unwanted intermodulation due to the non-linear action of the phase detector (i.e., mixer). To reduce the unwanted reverse signal, we can do 2 things. First, we provide isolation through the power divider used to minimize the cross talk between the 2 RF input synthesizers. Second, we can provide additional isolation on each synthesizer arm through the use of attenuators or isolators. 12. RF input diagram using power divider that provides isolation. If instead of the PD-0010 resistive power divider we were to use a power divider that provides isolation, like the PD-0R413 Wilkinson power divider, the cross-talk should be reduced. Power traveling from one output port of the power divider to the other will be attenuated by the power divider’s isolation value. 13. Spectrum of the 2-tone RF input into the MM1-0312HS with the block diagram from figure 12 using the PD-0R413 power divider. Swapping in the PD-0R413 Wilkinson power divider reduces the 2 tone RF input’s IMD3 terms by 4dB. Using an even higher isolation power divider like the PBR-0006 should provide a slightly better result. 14. Spectrum of the 2-tone RF input into the MM1-0312HS with the block diagram from figure 12 using the PBR-0006 power divider. Incrementally increasing the power divider isolation marginally improves the measured output IP3 of the 2-tone RF input signal. While the 3rd order tones decrease, the higher order intermodulation products may change. 15. IF output spectrum of the MM1-0312HS with the block diagram setup from figure 12 using the PD-0R413 power divider. 16. IF output spectrum of the MM1-0312HS with the block diagram setup from figure 12 using the PBR-0006 power divider. The mixer’s measured IP3 is effectively the same. So we continue the example using the PBR-0006 because of the higher isolations. To improve the isolation 10dB attenuators are added to the circuit as seen in figure 18. The lowpass filters used in front of the synthesizers are DPX-9516s. They are reflective filters near the crossover point of the diplexer. Outside of the DC-9.5GHz lowpass filter passband, high frequency signals will reflect back towards their source. 17. 10dB attenuators added between the diplexer and power divider to improve the isolation by 20dB. Possible signal paths shown in blue and red. What is of interest for the reflective filters is the device under test (DUT) mixer’s finite LO-RF isolation and the mixer’s internal harmonics generated from the fundamental LO. The LO signal can, does, and will leak through from the LO port to the RF port and output into the RF input synthesizers. 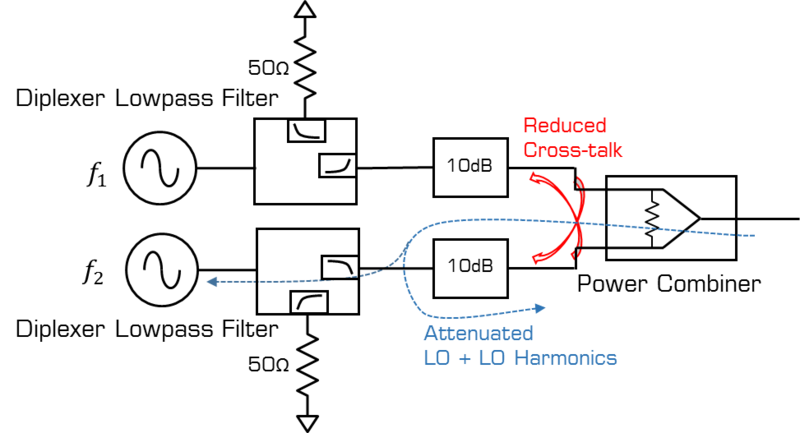 By adding 10dB attenuators between the lowpass filters and power divider, the LO fundamental tone and LO harmonic spurs’ leak through is reduced by 10dB. Any LO harmonic reflections will be reduced by 20dB before remixing in the mixer.e.g., For a typical Marki GaAs MMIC double balanced mixer, the LO to RF isolation will be approximately 40dB. So an input of a+15dBm fundamental into the LO port will give -25dBm at the RF port that could remix if reflected. If the 2nd LO harmonic is strong enough, that can also remix. Unless the LO frequency is low, the higher order harmonics will be rejected (reflected) by the RF balun of the mixer. Because the LO harmonics can be an issue, along with any passive intermodulation products, the power divider’s combined output should be filtered. 18. RF input block diagram from figure 18 with a diplexer presented to the mixer. Instead of using another a filter in front of the mixer’s RF port, a diplexer (not duplexer) is a good choice. A diplexer is wideband enough to provide a path for the 2nd and 3rd order LO to RF harmonics coming out of the RF port to be terminated in a 50Ω load. The diplexer used must be carefully chosen to avoid the LO harmonics from reflecting back into the mixer. Otherwise, the power divider is a better interface to present for impedance matching considerations. This provides a 1dB improvement in the IMD3 spur power that is input into the mixer. 19. Spectrum of the 2-tone RF input into the MM1-0312HS with the block diagram from figure 18. 20dB internal attenuation in the spectrum analyzer. There is no change to the measurement of the mixer’s IP3 from the addition of the 3rd diplexer in front of the mixer’s RF port. 20. IF output spectrum of the MM1-0312HS with the block diagram setup from figure 18. All spectrum analyzers have a front-end mixer prior to their IF envelope detector circuitry; that mixer limits the dynamic range of the system. To make sure that the spectrum analyzer’s mixer does not generate its own harmonic content and disturb the measurement, the power into the spectrum analyzer must be attenuated to prevent overloading the receiver. Secondarily, we want to suppress the front-end mixer from re-mixing higher order products. If we check against the spectrum analyzer datasheet, our Rohde and Schwarz FSW85 has a typical IIP3 of +30dBm with a minimum of +22dBm for an input frequency of 100MHz to 1GHz. For our input powers (-8dBm on both fundamental IF tones) into the spectrum analyzer that floor is approximately -70dBm if we back calculate with our standard IP3 formula. So the IMD3 spur can be down ~-70dBm (with no internal attenuation) before the spectrum analyzer will hit its dynamic range limit. This is the second floor of the measurement that can fundamentally limit the measured dynamic range of the DUT. You must have a better part than the DUT within the test equipment to measure the DUT. As a precaution, we can filter the input of the spectrum analyzer to prevent high order harmonics from mixing within the spectrum analyzer. 21. IF output spectrum of the MM1-0312HS with the block diagram setup from figure 18. Using a DPX-0R5 to filter the mixer IF output, we see that the above measurement was not impacted or changed when we correct the OIP3 value for the approximately 3.5dB insertion loss of the filter. IIP3 will not change because the RF input to the mixer has not changed. OIP3 will because it is an output referred value. Next, we can attenuate the mixer IF output by 20dB to prevent overloading the spectrum analyzer’s front-end mixer and improve the impedance match. 20dB is used arbitrarily and a significant enough attenuation value should otherwise be used. 22. IF output spectrum of the MM1-0312HS with the block diagram setup from figure 18 with a DPX-0R5 lowpass filtering the IF output and a 20dB attenuator. If we add 20dB back to the above OIP3 measurement, we see no negative impact to the measurement; just an additional hoop in the IP3 calculation. So we can disregard this source of error unless the measurement calls for it. An example of when this could be necessary would be when the DUT (device under test) mixer’s IF output has a high power (>+5dBm) or when the spectrum analyzer’s internal attenuation is insufficient. From a mixer use standpoint, the argument in Error Source #4 makes sense. To prove it, what if we remove all attenuation into the spectrum analyzer? 23. Measurement from figure 21 repeated with 0dB internal attenuation on the spectrum analyzer. The remeasured OIP3 is +15dBm. To interpret the result, do we say that the measurement improved or is this an erroneous result? We can verify this by removing the DUT. If we compare measurements of the OIP3 of figure 21 with and without internal attenuation turned on in the spectrum analyzer, we see that the measurement significantly degrades. 24. Spectrum of the 2-tone RF input into the MM1-0312HS with the block diagram from figure 20. 20dB internal attenuation in the spectrum analyzer. Identical to figure 19. 25. Spectrum of the 2-tone RF input into the MM1-0312HS with the block diagram from figure 19. 0dB internal attenuation in the spectrum analyzer. Because the measurement of the 2-tone RF input without attenuation is noticeably different than the measurement without attenuation, it’s very likely the spectrum analyzer’s front end mixer was overloaded and gave an erroneous result when no attenuation is applied. This is the same case for the MM1-0312HS and a measurement without attenuation protecting front-end mixer of the spectrum analyzer should be disregarded. There should always be some attenuation present to protect the front end mixer of the spectrum analyzer from being overloaded. Typically, 10-20dB attenuation is sufficient. In addition, it is always good practice for the instrument to be run in a as low a resolution bandwidth (RBW) as possible. The reduced resolution bandwidth allows for a slower, more precise measurement to be taken. This reduces the measurement bandwidth of the analog to digital converter within the spectrum analyzer. A resolution bandwidth of 10Hz will measure a tone with 10Hz instantaneous bandwidth versus a resolution bandwidth of 300KHz which will attempt to measure a tone with up to 300KHz instantaneous bandwidth. Using a slower resolution bandwidth avoids measuring the side of the tone aswell as improving the noise floor of the measurement. Generally, the resolution bandwidth will automatically adjust and lower itself when the frequency span of the instrument is set. It can also be manually set for most modern test equipment. Refer to the operator manual for guidance. 26. Final block diagram of the recommended mixer IP3 test setup on a spectrum analyzer. Optional blocks are highlighted. The block diagram is the final test setup in figure 29. Its measured MM1-0312HS IP3 data is below in figure 29. For the measurement in figure 30, the LO filter was omitted. Practically, the high order spurs that mix off the 2nd LO input harmonic that fall on top of the and intermodulation spurs should be at a much lower power than the intermodulation products. Like the results from section Error Source #4, the LO filter is a test condition dependent block. In particular, it is undesirable to filter the 3rd harmonic if you’re driving a classic, hybrid T3 style mixer with a square wave LO; less so if you’re using a newer MMIC T3. The reason behind this is, because for a T3 style mixer, the 3rd and 5th harmonics of a square wave LO remixes and biases the diodes within the mixers in such a way that the mixer nonlinearity is improved over a normal sine wave LO. For a double balanced mixer, the LO filter may or may not be necessary. Typically, it is not because the LO’s second harmonic can be pushed out of band of the mixer. If we retest the MM1-0312HS with the block diagram from figure 28, we should see an improvement compared to the block diagram from figure 5. 27. IF output spectrum of the MM1-0312HS with the block diagram setup from figure 26. 28. IF output spectrum of the MM1-0312HS with the block diagram setup from figure 5. Identical to plot to figure 6. There was an improvement of 0.5dBm in the measurement of the mixer’s IP3. This is only slightly more in-line with the VNA measurement. This 0.5dBm change could practically be only attributed to measurement uncertainty. The measurement uncertainty in our Rohde and Schwarz FSW85 is 0.3dB for this measurement frequency. Practically speaking, the IP3 measurement between both test setups are virtually identical. So confidence in the accuracy of the measure can be confirmed. However, the real improvement is in the IP3 measurement of the 2 tone RF input. 29. Spectrum of the 2-tone RF input into the MM1-0312HS with the block diagram from figure 5. Identical to figure 7. 30. Spectrum of the 2-tone RF input into the MM1-0312HS with the block diagram from figure 18. Identical to figure 19. What this means is that we should be able measure very high IP3 values because the measurement is closer to ideal conditions where the input intermodulation products are not present and mixing down to the and frequencies. Choosing the MT3-0113LCQG,and instead of a +15dBm LO, we use a higher power +25dBm square wave LO and repeat the comparison. The higher LO power should give a high IP3 measurement and push the measurement system to its dynamic range limit. The test is: Will the improvement to the 2-tone RF input IP3 allow for high mixer IP3 measurements? 31. IF output spectrum of the MT3-0113LCQG using the block diagram from figure 5 with a +25dBm square wave LO. 32. IF output spectrum of the MT3-0113LCQG using the block diagram from figure 26 with a +25dBm square wave LO. There is an improvement of 1.5dB in the measured mixer IP3. This is a 40% improvement in the measured value over the quick and dirty mixer measurement. If the same test setup is used but the mixer device under test from the MT3-0113LCQG to a T3-03MQP or any other mixer, what can be seen is that the dynamic range of the spectrum analyzer was reached or very close to being reached. While the mixer IP3 measurement has improved, there is no such improvement that can be made without using a better spectrum analyzer. If we test the H diode version of the mixer which differs from the L diode version of the mixer based on the forward turn on voltage of the mixer’s diodes, the MT3-0113HCQG, we see that the resulting measurement is the same. 33. IF output spectrum of the MT3-0113HCQG using the block diagram from figure 26 with a +25dBm square wave LO. What can be inferred from the H diode’s measurement is that for this IF frequency ~300MHz, the spectrum analyzer can only measure the up to a ~+25dBm OIP3. The spectrum analyzer hit its dynamic range limit. It is an expectation that a higher barrier diode variant of the same mixer (same circuit typology, RF/LO baluns, wiring, etc.) to have better linearity than its lower barrier version. The higher barrier diode version of a mixer should have a an IP3 of dB higher than the low barrier diode mixer; where is the forward turn on voltage of the high barrier diode and is the forward turn on voltage of the low barrier diode. This can be verified against the datasheet. For further comparison for the argument of which diode variant should be superior, measurement of identical mixers with 2 diode variants such as the MM1-0626HSM and MM1-0626SSM should be explored. Both MT3 variants’ corresponding datasheets agree that for the same test conditions on a VNA, the measurement of IP3 at 6GHz RF differs by approximately 3dB; the datasheets can be found here for the H diode version and here for the L diode versions. For a T3 style mixer, the difference in diode version matters to a lesser extent, a similarly strongly driven L and M diode T3-03, for instance, will typically have a very similar IP3 value. This also holds true for the MT3s. 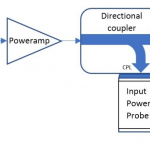 To improve a mixer’s IP3, circuit topology in addition to diode forward turn on voltage matters. A +5dBm improvement in the 2 tone RF input IP3 is a lot. It’s a 10dBc improvement in the IMD3 spur suppression relative to the IF down converted fundamental frequency. For very specific circumstances, where the front-end mixer of the spectrum analyzer is in a “sweet spot” this improvement can greatly improve an IP3 measurement. The time and capital consuming test setup for high IP3 measurements can be completely unnecessary. The ability to do the measurement depends highly on the dynamic range of the 3 synthesizers and the spectrum analyzers used. For the measurement provided in this document, it appears the front-end mixer of the spectrum analyzer is the limiting factor stopping the measurement of mixer IP3 values higher than ~+31dBm. This is evidenced by the decreased measurement resolution when spectrum analyzer input attenuation is removed and the disagreement between the measurement of the high barrier diode mixer and with its sister low barrier diode variant. For a normal, or even good, mixer measuring the IP3 using a quick and dirty setup is not punishing. Results agreeing to within 1.5dB against the published datasheet is very good considering the time and capital costs (approximately $150K USD) of setting up a proper IP3 measurement station. Results are very much acceptable using a bare-bones test setup. In order for any of the solutions in this document to be of use, the dynamic range of the measurement equipment must be higher than what was used to gather the presented data and the DUT mixer must have an extremely high IP3. The RF/Microwave parts used for the test station can be found here for high isolation power dividers and here for high suppression filters. Look forward for high >+35dBm IIP3 highly linear MMIC T3 mixers covering high frequency bands in the near future. Contact [email protected] for more information regarding all products.